The Iranian diaspora in the United States, supporters of the MEK, call on the upcoming Ministerial conference in Warsaw to support the Iranian people’s uprising in Iran for regime change. 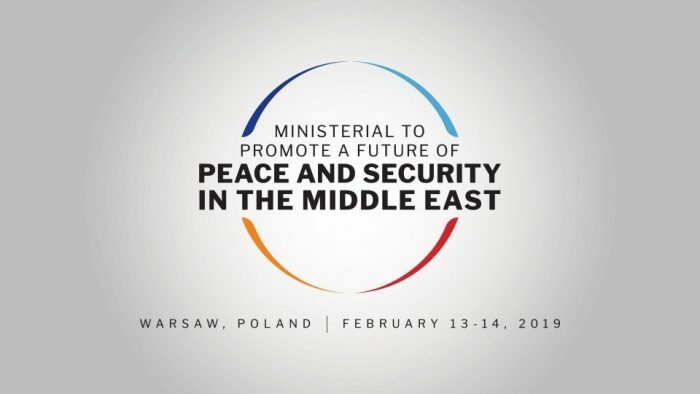 Ahead of the Warsaw Ministerial Conference, when governments will meet in the Polish capital on the 13th and 14th of this month to discuss the Iranian threat, the Iranian diaspora in the United States took out an ad in the Washington Times. 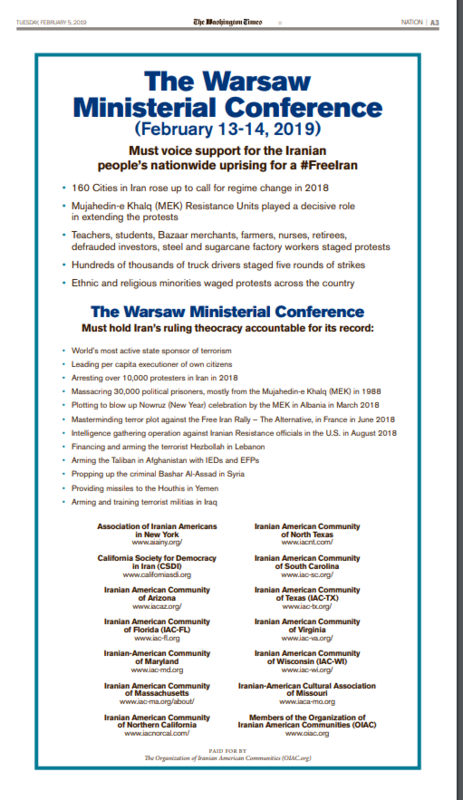 Fourteen Iranian-American groups, including the Association of Iranian Americans in New York, the California Society for Democracy in Iran, the Members of the Organization of Iranian American Communities, and the Iranian American Community of Massachusetts, took out the whole-page ad to demonstrate the need to hold the Iranian regime to account. 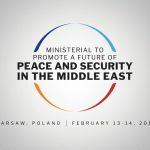 The Iranian diaspora in the United States call on the upcoming Ministerial Conference in Warsaw to support the Iranian people’s uprising. The Iranian regime is the world’s leader in executions per capita. Its people suffer gross human rights abuses on a daily basis. In 2018, the regime detained more than 10,000 protestors in Iran. Their crime was merely taking to the streets to demonstrate their political opposition to the regime. The political opposition living abroad have been the target of the world’s largest state-sponsored terror campaign. The People’s Mujahedin Organisation of Iran (MEK) have been persecuted. In March, an Iranian plot was uncovered to attack their compound in Albania where more than 2,000 live in exile. Then, in June, at the MEK’s annual Grand Gathering event where more than 100,000 international politicians and supporters meet in Paris, the Iranian regime orchestrated a plot to detonate a car bomb. The plan was foiled by Belgian authorities when they arrested a Belgian-Iranian couple en-route on the event in a car laden with explosives. Beyond planning terror attacks, the Iranian regime is also financing terrorist and militia groups across the Middle East. Their finances flow to the coffers of Hezbollah, the Taliban, Bashar al-Assad’s regime in Syria, the Houthis in Yemen, and militia groups in Iraq. The regime’s heinous crimes and destabilizing activities have not gone unnoticed. The Iranian people launched a nationwide uprising at the beginning of 2018. The movement led to protests spreading across 160 cities and towns in the nation in all 31 of Iran’s provinces. The MEK played a central role in these protests, facilitating communication through resistance units that distributed pamphlets and organized protests. These protests represented a decisive moment in the opposition movement. The ranks of the protestors swelled to include teachers, students, merchants, farmers, nurses, retirees, investors, factory workers, and truck drivers. Demographics that the regime typically relied on for support have turned against the mullahs and are joining the opposition movement in larger numbers than ever before. The statement by the Iranian diaspora, published in the Washington Times, expresses two points in bold. “Must voice support for the Iranian people’s uprising for a #FreeIran,” and “must hold Iran’s ruling theocracy accountable for its record.” The regime’s heinous and violent behavior and the momentum the Iranian opposition is building demonstrate the need for both. The mullahs’ current position is untenable. The international community would be well-placed to acknowledge that.